WORKSHOPS: This involves a public engagement process creating and writing a manifesto of binary code based gathered from the public. The answers can become customised to your city or specific issue or area of interest. There is already a manifesto made from previous workshops. However the questions can be re-asked in your location and new information and data gathered that informs the project. The concept is to explore and create new futures. How do we create a new world of active ingredients that is politically motivated? . We want you to imagine your future, the future of the planet, the future of politics, the future of the city. We want you to imagine changing the world, your city, yourself. GRAFFITI: This is an outdoor series of artworks in the city created by the public who get involved in making art in the city. Participants can use the stencils that are already produced . The sites are sourced, permission is asked and chalk spray paint is used so it washes away and is non permanent unless requested. The option here is either to use the stencils I have or create new ones. Creating new stencils involves first having new workshops. CITYWIDE DATA VISUALISATION: Public spectacle event. This custom software tracks everyone. We own our own data in this project that reclaims the data space. See project The Global Derive. BOOK. The images would make a good book. If you want to publish get in touch. HOODIES. They will be for sale soon...let me know if you want to distribute or bulk buy. 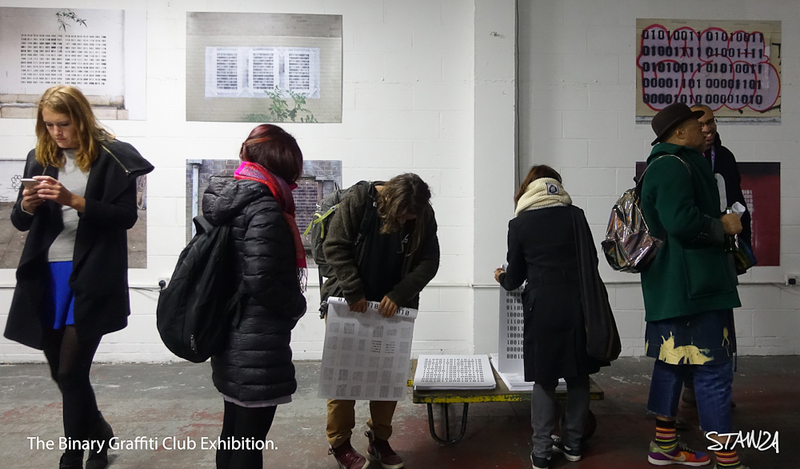 The Binary Graffiti Club and related projects are available for exhibitions and public engagement events. Working with groups of people set in various contexts all be wearing the specially made binary hoodies. If you want to invite this project to your city get in touch. CREDIT. The Binary Graffiti Club. An arts project By Stanza. This is an arts project by Stanza. 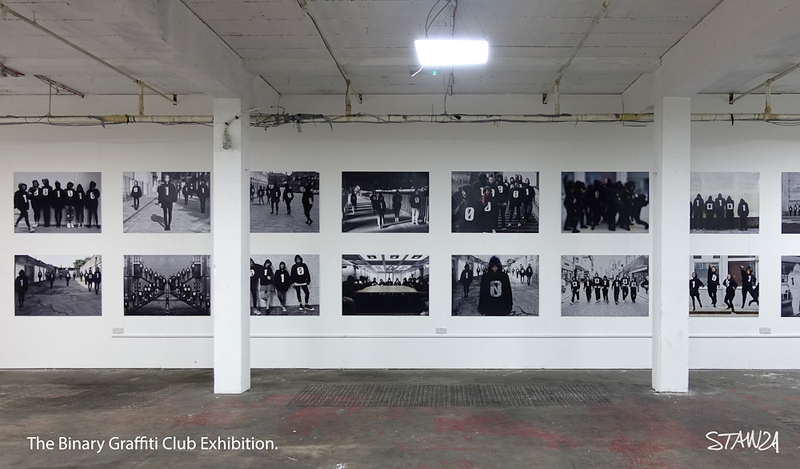 Stanza is a London based artist who is interested in the participatory system the 'city' that frames questions within his work opening up conversations about the politics of space. Recurring themes throughout his career include the urban landscape, surveillance culture, privacy and the real time city. Stanza has been exhibiting worldwide since 1984. His artworks have won twenty international art prizes and art awards including:- Vidalife 6.0 First Prize Spain. SeNef Grand Prix Korea. Videobrasil First Prize Brazil. Cynet Art First Prize Germany. Share First Prize Winner Italy: Stanzas art has also been rewarded with a prestigious Nesta Dreamtime Award, an Arts Humanities Creative Fellowship and a Clarks bursary. Numerous commissions include work for Wolverhampton Art Gallery, Watermans Art Centre, FACT, and the Open Data Institute. Thanks to Diffusion for production in Wales. Thanks to Cynetart for staging in Germany. Thanks to Lincoln and all the volunteers V2 and Fequency Festival. Thanks to Liverpool Free Runners for V1 and FACT.